Oops - we don't appear to have a video for the Strobe 400. The Strobe 400 is a duplex scanner for the busy professional who needs a fast and reliable scanning solution that can be used anywhere. Measuring only 11.6" x 2.5" x 2" and weighing a mere 22 ounces the Visioneer Strobe 400 is the world’s smallest cross-platform document scanner. It easily fits on a crowded desk or in a tight briefcase. With Visioneer’s AutoLaunch™ technology, the Strobe 400 automatically scans documents as soon as they are inserted into the scanner. When used in duplex mode, it scans documents at only 6 seconds per image. 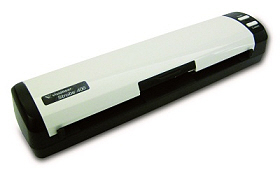 Designed to provide a low cost duplex scanning solution for vertical markets such as healthcare, banking, insurance, legal and retail, the Strobe 400 instantly turns paper documents into distributable digital files. Users can scan, file and store all of their documents, plastic ID cards, checks, articles, brochures and business cards regardless of location because the Strobe 400 may be powered through a USB port, or via wall-power. Visioneer OneTouch is an easy to use utility that connects the buttons on the Strobe scanner with a powerful set of scanner settings to greatly improve the efficiency of your workflow – so that with one touch, the document is scanned automatically to email, or Word, or your printer, or simply a file folder. If you can’t search your scanned documents by their content, you might as well be looking at paper again. The Strobe 400 can scan automatically to searchable PDF. It preserves the integrity of the scanned page so that layout, signatures, logos, photos, etc., remain intact, but the text is OCR’d so that you can search the document by its content. This is very powerful when looking for a single document among hundreds or thousands.